• Do not hit or allow any objects to impact the locations where air bags or sensors are installed. This may cause unexpected air bag deployment, which could result in serious personal injury or death. • If the installation location or angle of the sensors is altered in any way, the air bags may deploy when they should not or they may not deploy when they should, causing severe injury or death. Therefore, do not try to perform maintenance on or around the air bag sensors. Have the vehicle checked and repaired by an authorized HYUNDAI dealer. • Problems may arise if the sensor installation angles are changed due to the deformation of the front bumper, body or B pillars or front door where side collision sensors are installed. Have the vehicle checked and repaired by an authorized HYUNDAI dealer. 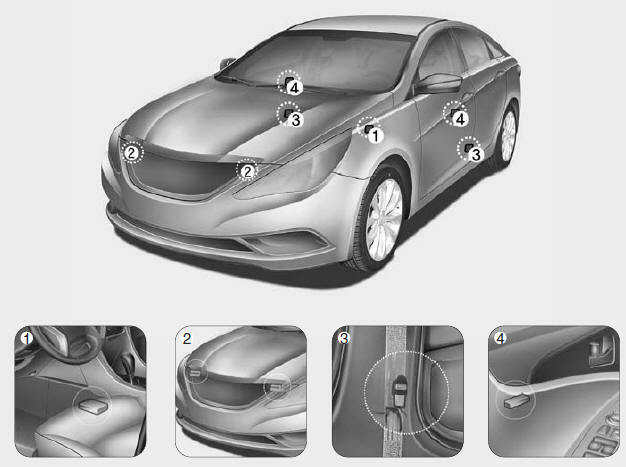 • Your vehicle has been designed to absorb impact and deploy the air bag(s) in certain collisions. Installing bumper guards or replacing a bumper with non-genuine parts may adversely affect your vehicle’s collision and air bag deployment performance.